On the 7th of June, Ocean Energy Sweden gathered the Swedish value chain in Stockholm to discuss the Swedish ocean energy program and share experiences from within the sector. The event gathered around 40 people covering the value chain in Sweden. The second session of the day focused on the Swedish research relating to the ocean energy sector. 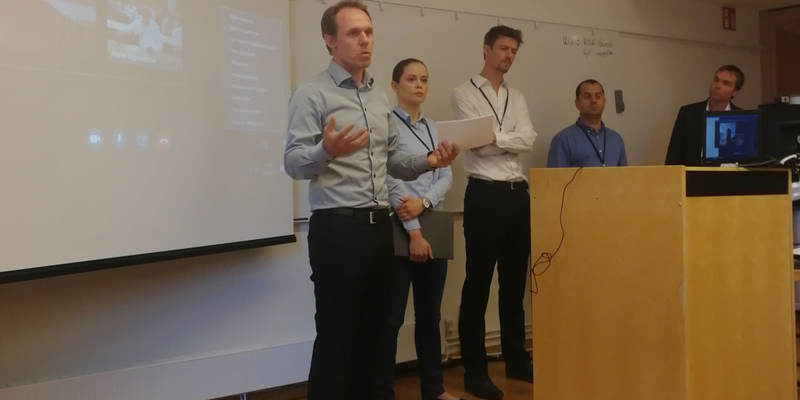 Short presentations were given by Johannes Palm (Chalmers), Emiliano Pinori (RISE), Anders Hagneståhl (KTH), Irina Temiz (Uppsala University) and Sam Fredriksson (University of Gothenburg). After lunch the participants returned for the third session which focused on collaboration to achieve global success, also involving a general discussion of what is needed from the industry’s point of view. The industry was in this case represented by Anders Olsson (PMCCylinders), Joakim Nyström (SSAB Special Steels), Mathias Johanson (Alkit Communication), Patrik Möller (CorPower Ocean) and Magnus Rahm (Waves4Power). Notable from this session was the discussion of risk elimination relating to the importance of trust and collaboration between developers and suppliers. Mattias Johansson, Alkit Communications, discussed the importance in learning from your customer to fully understand what is needed.